One of the greatest U.S. presidents was Abraham Lincoln. 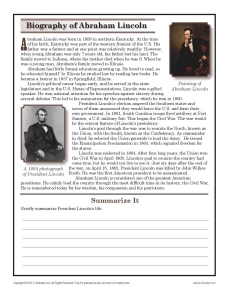 Your student will read a short biography of Lincoln and summarize it. The worksheet works well with Common Core Standards for Key Ideas and Details for 7th grade. You may also find it helpful for other grades.